Welcome to the 4th Annual Purge Your Spurge Spring Event! In connection with Comcast Cares Day! SLC Trails & Natural Lands will receive a financial contribution in the form of a Thank You grant which will be used for improvement projects and programs. Even through the snow and cold . 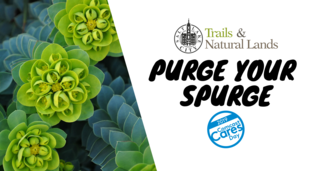 . . Our 4th Annual Purge Your Spurge Event was our biggest and most successful yet! What is Myrtle Spurge? Myrtle Spurge is a Class 2 Noxious Weed that grows in large, scattered colonies on our Open Spaces of Salt Lake City. This specific time of year is very significant to the plant's reproduction. We must dig up these plants before their "flowers" (actually colorful bracts) produce seeds. These seeds spread easily and this plant out-competes native species. Help us in our yearly purge! How Does The Friendly Competition Work? We will compare overall weights of Myrtle Spurge collected and bagged at each location. The winning location will be given the title of "Top Myrtle Spurge Purger 2019"! Last year our teams pulled 9,385 lbs of myrtle spurge combined. How Do I Get Involved? Sign up with your team below OR Do you have a workplace full of rad coworkers, a boy scout troop, a church group, a large family, or a bunch of enthusiastic friends? Contact [email protected] to create your own team. Remember to wear long sleeves, long pants, and closed toed shoes and bring a refillable water bottle. Bring a shovel if you have one available! We will provide gloves to those who don't bring their own. Sorry, but no participants 12 years or younger. Lunch and Prizes at ROTARY GLEN PARK for participants - 2820 Emigration Canyon Rd also known as Sunnyside Ave.